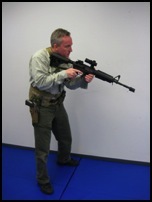 These positions represent the most common pre-engagement stances one would find themselves in, prior to action, with either rifle or pistol. By keeping the names of these positions consistent we can minimize some confusion on the firing line. This is a natural comfortable stance. The hands are away from the pistol. 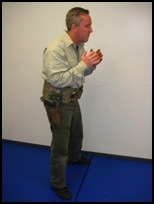 We use this position to work from the holster. 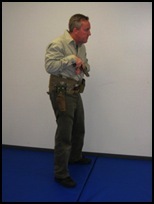 During some drills, for example Pistol Drill 4, we return to the holster as a range safety issue to recover the empty magazine. Once the equipment is re-stowed, we might as well get a draw repetition out of the exercise. The Ready Position can also be called an interview stance. Most people will turn slightly to position their body between the interviewee and the holstered weapon. 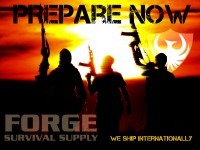 This position represents moving through a threat environment. The weapon is drawn, center line of the body and level. This makes for a possible rapid engagement while moving to Position 4 or full presentation. A variation to Position 3 is the Sul position, where the weapon remains centerline but is pointed downward. Or, any form of retention or weapon protected position. 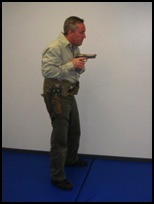 This position represents moving through a (relatively) low threat environment or a situation where muzzle discipline is very important.